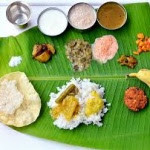 Class will continue with Sri Lakshmi Astottara-Shata-Nama Stotram (also known as Sri Lakshmi Astottara Stotram). Make sure the printout is in the child’s binder. 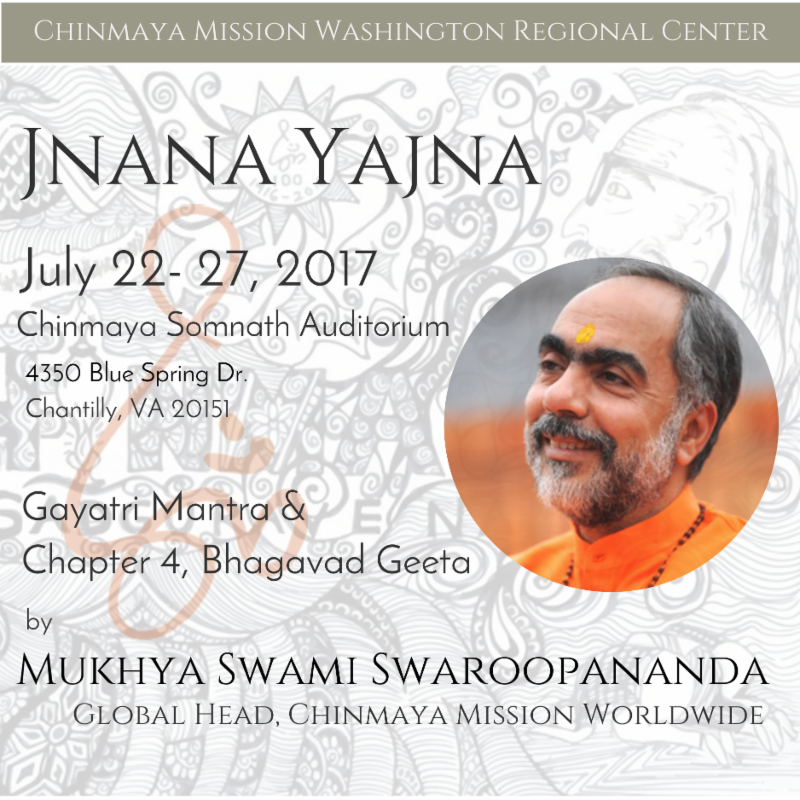 Two Chances to Remember and Celebrate Hanuman at Chinmayam! Sri Hanuman Jayanti Celebration at Chinmayam! 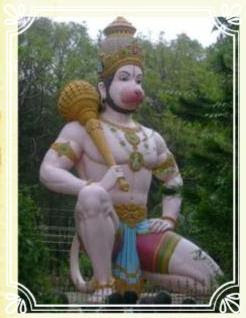 One gets wisdom, strength, fame, courage, fearlessness, health, alertness and eloquence by remembering Hanuman! Come celebrate Hanuman Jayanti at Chinmayam! Support our CHYKs and Chinmayam Students for a special EIGHT-hour nonstop chanting of the Hanuman Chalisa in alternating raagas! A unique celebration to share the joy of Hanuman Jayanti, in solidarity with other CHYK chapters across North America. 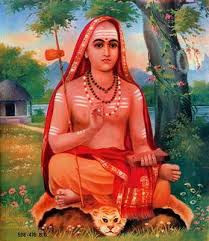 The program is open to all and will be followed by a special message from our Pujya Swami Dheerananda. Multiple slots OPEN for Saturday! If you have not signed up for Annapurna Seva to-date, please consider signing up! Please don’t forget to pack SPOONS/FORKS with your plates or lunch boxes previous night! It’s that time of year when sneezing, coughing, itchy eyes and runny noses are abound. With high pollen counts during Spring, many turn to medication looking for relief from nagging allergies. If you’re one of them, give the neti pot an honest try…you’ll be surprised with the results. Jala Neti is the practice of cleansing the nostrils with saline water using a simple neti pot. It can be practiced daily by nearly anyone with no unhealthy side effects. You’ll experience clearer breathing and almost immediate relief from allergy symptoms, sinus, headache, snoring and more. It’s quick and easy to do, and once you get the hang of it, it’ll become part of your morning routine…keeping you free of sinus problems and medications. Click to learn How to practice Neti. Author: Amita Jain. Amita is a certified yoga instructor teaching traditional Hatha Yoga and studying Ayurvedic medicine for over 20 years. She teaches a natural, holistic approach to healing, combining practices of Yoga and Ayurveda derived from the ancient Vedas. Update: $37,000 in sponsorships so far!!!! Chinmaya Mission Land Acquisition Project (CM-LAP) is our collective effort to acquire 17.81 acres of land adjacent to Chinmayam, our Chinmaya Mission center in Silver Spring, MD. 2. What is CM-LAP Fund Raiser on May 13th, 2017? When we started CM-LAP, our projected cost was 1.5 Million Dollars. During the initial fund raising that started in June 2016, we received pledges from approximately 200 Chinmaya Mission families totaling $900,000. This left a gap of $600,000. To reach our goal, Swami Dheeranandaji suggested that we conduct a Music Yagna of its own sort, by one of the Bal Vihar student of Chinmayam Ashwin Balsubramaniam and his wife, Laxmi Chandrashekhar Balsubramaniam. 3. If I have not contributed yet to CM-LAP, can I contribute now? Exactly right, we want you to consider your generous donations to CM-LAP fundraiser. Keeping the goal of $600,000 in mind, we have kept limited seats for $1000 pledge per seat, plenty of seats with $2000 pledge per seats. We have limited seats in the front row with $5000 pledge per seat. We are requesting donations to have our respected Acharyas attend the fund raiser and be seated in front row. 4. If I have contributed to CM-LAP last year, should I contribute more? Exactly right, we are requesting your generous sponsorship to help us reach our goal. Please reach out to your family and friends to see if they would support our worthy cause. 5. If I can not contribute in the range being requested, can I still contribute to CM-LAP? Exactly right, please contribute as we value each and every dollar that we receive with great respect and admiration. Your help will definitely help us to reach our goal. 6. Are there separate tickets for adults and children? No, for this particular fund raising event, each seat is sponsored at suggested donation. 7. Who should I reach out to if I have further questions? Come learn in a day’s time the secret to permanent happiness!!! 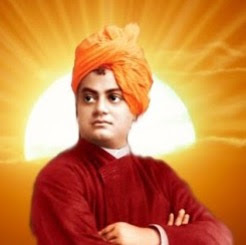 Theme – Swami Vivekananda, Arise! Awake! Call for Summer Camp Volunteers! Accommodation will be provided for out of town attendees! Please spread the word and mark your calendars. Chinmaya Naada Bindu (CNB) is a residential gurukul for Indian Performing Arts dedicated to fostering classical music and dance forms of India through education, research and performance. 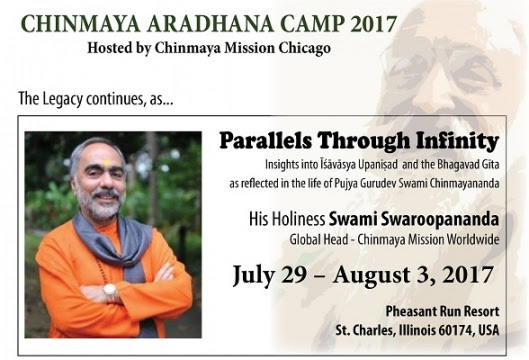 CNB will host their Monsoon Intensive Program here in Chinmayam, MD! Program will be conducted by our very own Purvi Nanavaty! The workshop is based on the book, ‘The Life of ‘I’ – On the Sadhana Trail’ written by Swamiji himself. It details the discovery of the True Self that is made through the story of an agnostic who becomes an ardent seeker. Workshop will be interactive with group discussions and activities and will cover the four paths – Karma Yoga, Bhakthi Yoga, Dhyana Yoga and Jnana Yoga. Even if you cannot attend all sessions, you can attend the Saturday (April 22) sessions, since the topics are fairly independent.